Fill in each field. You can can choose any password that you like. We will not have access to this password, but you will be able to reset it via email should you need to. You will need a Student Pairing Code. 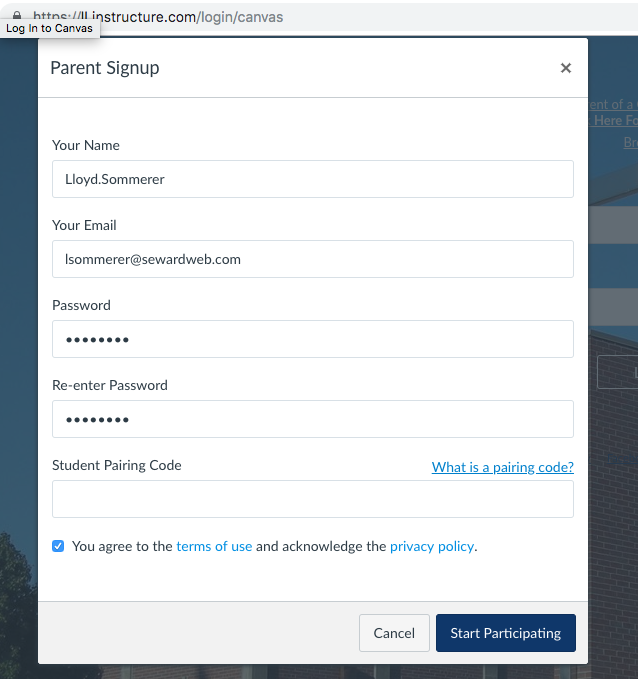 Your child can get this for you by logging into Canvas and clicking on Account then Settings then Pair with Observer. The Pairing Code will look something like this: O2wEFQ. The school office can also get a Pairing Code for you if your child has difficulties. After you enter the pairing code and agree to the terms of service, click on "Start Participating.". After you click "Start Participating", you will see your student's classes. They should be able to show you around and help you get familiar with the system. Notice that there is a message at the top of the screen asking you to set your Notification Preferences. You can turn the others off by clicking on the X on the right side of each row. 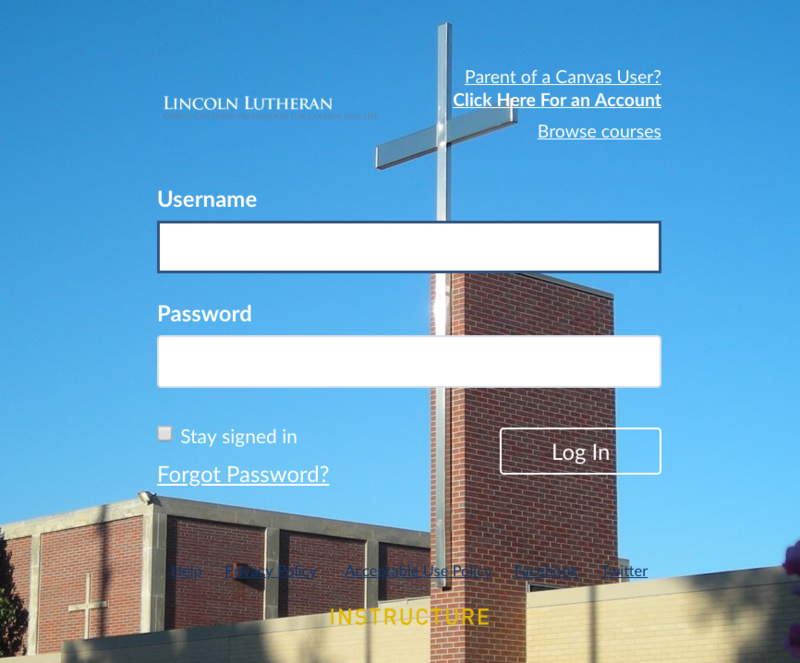 You might also want to click on the "Show name of observed students in notifications" if you have more than one student at Lincoln Lutheran. This checkbox is located near the top of the Notification Preferences page. You can change these notifications at any time by going to Account then Notifications. You can add additional student by going to Account then Observing. Your username for Canvas is your email address. 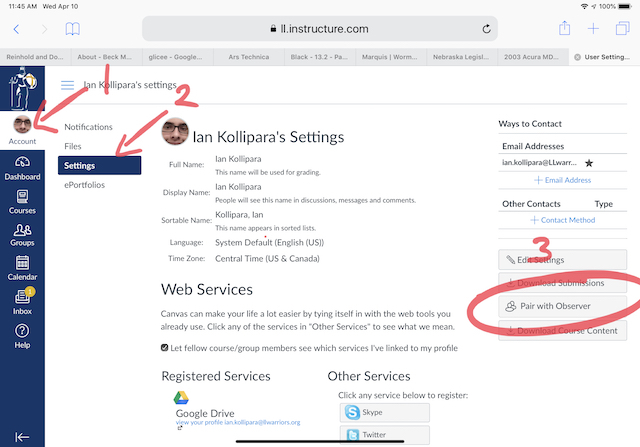 From now on when you go to Canvas, you'll enter your email address and password and you will be able to see your child's assignments, class resources and so forth.